It doesn't get more simple and delicious in my book. This roasted cauliflower tastes decadent. So good that you will keep eating till it's gone. Absolute best straight out of the oven! Preheat oven to 425. I use my amazing Breville Smart Oven to roast all my veggies (amazon link in side bar). Regular oven is fine too. Toss your washed and dry cauliflower florets in oil. Add salt. Roast till nice and golden brown, about 1/2 hour. Mix occasionally to get it to brown evenly. Serve straight out of the oven if possible or reheat on a hot skillet. 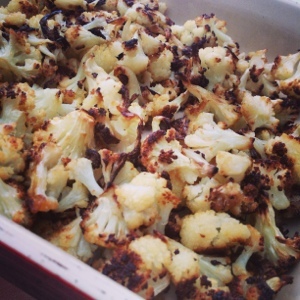 I LOVE roasted cauliflower but never thought to use truffle oil for it! I know what I'm doing next time I get some cauliflower! I'm kind of kicking myself for not getting any yesterday when I saw it on sale. It really makes it even more decadent!